Two and a half years ago I visited Zuni for the first time, to meet my British friends Kevin and P for Sunday brunch. P didn't live in the USA back then. She had been flown out from the UK that weekend for an interview with a South Bay company and so, as two of her oldest friends who hadn't seen her in way too long, Kevin and I met up and spent the day with her. We all liked Zuni so much that I even bought P The Zuni Cookbook as a gift for her following Birthday, her first living in San Francisco. Yes - she got the job. Unfortunately, Kevin since lost his job and work visa forcing him to return to the UK, which is why the three of us gathered for the last time together in San Francisco at Cafe Gratitude a few weeks ago. After more recently reminding myself how much I like Zuni, I can't help feeling we should have thought about the full circle and given Kevin a send off from this classic San Francisco eaterie instead. The other Saturday, after spending well over an hour in a traffic snarl up on the way home from work too late on a Saturday evening, I arrived home to find no food in my pantry. Longing for a little fun after a day of toiling infront of a computer, I weighed out the options. It was aready 10.30pm and San Francisco is not a late night town. The choices for dining after 11 are far and few beween. Oola was out because we'd been there so recently. I had fancied trying Globe one day but reread Fatemeh's review and decided it was just a little too much of a risk. The Brazen Head was too far away and I simply didn't feel like Absinthe. I said to Fred, I suppose we could go to Zuni and he totally jumped on the idea, so off we went. After 11pm, Zuni don't take reservations and when we arrived there was plenty of room for walk-ins. Zuni is an odd shape, with nooks, crannies and multi levels. 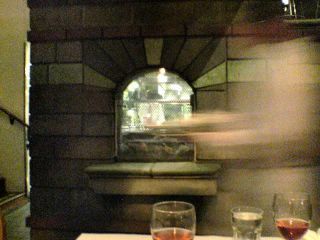 We were seated opposite an internal window which gave us a view right into the busy kitchen. Our first waiter wasn't really on the ball but when he, presumably, finished his shift he was replaced by a wonderful waitress who guided us superbly through the rest of our meal. I have been going through a little oyster craze recently, so I started with half a dozen. Beautifully presented and perfectly shucked, out of the two varities I'd chosen, I preferred the Hog Island humamoto over the brinier Sweetwaters. Next we shared a braesola salad with beets, fromage frais and hazelnuts. The cured meat was too thickly cut and near impossible to chew. This was a shame as the rest of the salad was good, especially the nuts which tasted far superior than any nut I have ever tried. It was quite a revelation. I had no idea a simple nut could taste that good. (And I like nuts.) When she came to clear our plates, the waitress asked what we thought. Often I just nod inanely and mutter 'fine' even when I am less than impressed. But on this occasion I felt a little braver. I meekly told her about the chewiness of the meat. She was really apologetic, surmising that it couldn't have been sliced thinly enough assuring us she would inform the kitchen. For my main course I chose duck with morello cherries and almonds. Wow-wee. The sharp cherries, a slight hint of cinnamon, tender breast and another sprinkling of the most incredible nuts, I would have declared this dish absolutely perfect if the duck hadn't been almost stone cold. The jus was so delicious I had to request a spoon, to slurp up every last drop. Fred was trying to persuade me to lick it off the plate and although it was certainly deserving of such a greedy act, I am a lady who has her reputation to consider, so i politely declined. Fred didn't fair so well with his spaghetti carbonara. The pasta was undercooked and he didn't want to make a fuss. Next time we visit I am betting he will be back on the famous Zuni burger once again. A picture of someone who knows when the time is right to enjoy their dessert. It seems that I have been using the excuse that I had no cake on my recent birthday one too many times since. I wasn't planning to have dessert but when the waitress mentioned the Caramel Pot de Creme I suddenly felt weak at the knees as my willpower made a running jump for the exit. Exquisite, smooth, silky heaven in a pot. The burnt caramel blended seamlessly with the heavy cream to create my own idea of total dessert nirvana. This totally blows away the Townhall's Butterscotch and Chocolate Pot de Creme, believe me. Eat it and weep. The waitress comped our dessert as an apology for the braesola which was a nice touch, byt really, I think I would have happily paid through the nose for this stuff. Online, I have witnessed local food lovers argue infinitum over whether Zuni is one of the best restaurants in town or overhyped rubbish. As someone who rarely, if ever, finds perfection in any one single restaurant, I forgive Zuni its foibles. I wouldn't hesitate to recommend it, especially as a place that ecapsulates the spirit of the Bay Area. Neither would I hesitate, not even for a nanosecond, to return for another sinful helping of Caramel Pot de Creme. Great review. I've never eaten at Zuni, but I worship the cookbook. That caramel pot de creme sounds heavenly - why oh why didn't you coax the recipe out of them? Not really sure what there is to hate about Zuni. It stays open late, it has great food and it's not trying to be something it isn't. As for the hype, I can think of quite a few places that fall into the overhyped (or all hype) category. Personally I think that if a restaurant has endured 20 plus years of operation it has a "reputation" rather than being hyped. such a timely post, sam. i'll be eating at zuni sunday night. thanks for the heads-up on the caramel pots de creme. the only dessert i've had there is the gateau victoire which is pretty damned good. Hi melissa - yes that would be a great recipe to have. If I ever get enough courage together I might ask. Haddock - you've got a good point. I imagine the naysayers have got it into their heads that Zuni is something it isn't which is why they like to grumble about it. Fatemeh - how about you just go there for late dining, This is my new plan. Dexygus - I hope you enjoy it. I hope you are going to report back - I'll be checking out your site after sunday. I feel like if I'm the one spending the money I'd rather go to Chez Panisse Cafe. But there is something so elegant and rustic about Zuni, it smells wonderful and I appreciate that it has been there for so long. Caramel pot de creme is easy to make. One need merely be unafraid of making caramel, which is dangerous and tricky. Elizabeth Falkner gave me the Zuni cookbook on my departure from CC and I went home and read it like a book. It's well written, eloquent to the point of romance and to the point. We are lucky to have it here still. I am sure it's not that easy to make. Even after the custard class, I am scared of making custard. But I have no fear of caramel. So Maybe I'll give it a try. Shuna - please can you remind me what kind of pan did you suggest we should get for cooking our custards in - I can't quite remember exactly but i am sure you said is should have high sides? I'm so disappointed that Zuni wasn't perfect. I guess Mr. Food Musings and I have been exceedingly lucky. We've probably eaten there a hundred times and never has Zuni failed us, either in food or in service. It's also de rigeur for any out-of-towners. My favorite seat is the quaint (some would call it smushed) two-top upstairs tucked away in the corner. It's very romantic. If you've never shared the roast chicken bread salad, the classic is well worth the 45 minute wait. I love Zuni Cafe, it is my bible for my blog specially when it comes to salting. Hubby and I ate there once when we visited San Francisco. We had oyster, rabbit salad, caesar salad and of course the Zuni roast chicken with bread salad. Wonderful experience and the dessert was the perfect ending! Hi Sam! So glad you liked Zuni! You may remember me from Tante Marie's - I gave you the lemons. I have since enrolled in their full time culinary program. My recent oral report for class was on Judy Rogers, chef/owner of Zuni. I stumbled upon your blog in my research. We are allowed to invite guests (no charge) for lunch on Tuesdays and Thursdays. If you are interested, call the school to "make a reservation" and tell them I invited you. 12:30 is the usual. Plan on 45min or so, but only stay as long as you can. It's very casual, of course. Would love to see you again and catch up on your recent culinary adventures. Undoubtably worthy of being on the worlds top 100 restaurants. We were there for our anniversary and my oh my... the deserts were fantastic!